How lucky are you, or are you not? That's the question Red Numbers asks. The story revolves around a guy who, according to a fengshui master, only three lucky minutes in his miserable life. His fortune is wrapped up with a greedy family whose grandfather holds the key to the winning combination in the 4D lottery. Three minutes, four numbers, a lot of money - or maybe not. Red Numbers was originally conceived by director, Dom Ow based on conversations with bookies about Ang Zi (Hokkien for red numbers) or popular betting numbers. It was re-written by writer-producer Koh Teng Liang in early 2011. 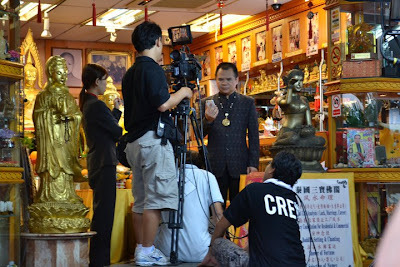 Shot in April/May 2011, Red Numbers features an eclectic and exciting ensemble cast comprising Singapore TV veterans such as Chen Su Cheng, Hong Hui Fang and Edmund Chen, up and coming stage and screen talents, a real fengshui master, and a first-time actor who scored a major role on his first ever audition. Photographed, production designed and coloured in the style of magical realism, Red Numbers hopes to be a very different Singapore film, with a little bit of luck. We speak with Dom and find out why the former army regular took the big step to become a filmmaker. Tell us about the experience of switching from an lieutenant colonel to a filmmaker. What inspired the change in industry? Does the label of a “first time feature filmmaker” bother you? How so? Not at all. First of all, it’s factually correct. Second, every film director who’s credible or significant had to make his or her first feature. And thirdly, the label actually affords you some advantages. I think the cast and crew seemed that little bit more patient with me when they knew it was my first feature. How much do you believe in the concept of feng shui and luck? How has it shaped your life? I believe there is a force bigger than all of us that influences our lives and our world. To some that may be God, to others fengshui, but in the end, we might all say, “some things were meant to happen.” I also believe that there is a balance and harmony in life and in the environment. Some people say that it’s fengshui to place objects in a certain way or to create buildings a certain way. I guess some other people would just call it good taste. Easy? There are no easy aspects of making a film. A film production is a recipe for disaster and it’s really a modern day miracle that films actually get made. I think for me, what was particularly challenging was working with a large ensemble cast, none of whom I had worked with before, and trying to appreciate very quickly, their strengths, weaknesses, motivations and quirks so that I could create the right environment for them to perform. How was it like working with veteran actors like Chen Shu Cheng, Hong Huifang and Edmund Chen? How would you rate their performances? I have nothing but respect for the veteran actors like Sucheng, Huifang and Edmund. First of all, it’s not easy being an actor, to put yourself out there to be judged all the time. But I think what I admired most about them were the professional values they brought to the set day in day out. They were always on time, knew their lines, studied their characters, had their energy levels up, and were ready with constructive suggestions to improve theirs and everyone else’s performances. If their performances were anything less than top notch, audiences can put it down to my direction. On the other end, you are also working with a first-time actor. What was the experience like working with him? Rubing was a first-time actor but he was a natural. There are some things you can learn in acting school or through experience: diction, hitting your marks, cheating for the camera, adapting to direction. He had none of these skills so he had to pick them up quickly or we would all have had a heart attack (or killed him) by the end of day 2. But when I say he was a natural, I mean that he had such a relaxed composure in front of the camera. He didn’t have to psych himself up to perform. After he got over the jitters of the first day, he simply walked on and became the character. How is this film different from the many other local productions out there? What do you hope viewers take away after the end credits roll? I think many viewers, particularly Singaporeans, take their 4D gambling very seriously. Without giving too much of the story away, I hope they can walk away, have a laugh at themselves, and not take their punting so seriously. Why do you think this film is worthy of more people’s attention? As much as this film is styled in magical realism, I think it reflects the interesting contrasts of Singapore today. Here I am, essentially an English-educated guy making a Mandarin feature. We have a very educated population whose students win the Math Olympiad but whose gamblers also believe that some 4D numbers have a greater probability of winning than others. We have scenes of the modern iconic Flyer but also icons of the past like the Bukit Brown cemetery and Rochor Centre. We have Chinese characters who don’t speak Mandarin and Chinese characters who can’t speak any dialects on screen or off. I think if you took a step back after watching Red Numbers, you just might find yourself saying, this is a little strange, but it is Singapore. After a number of grueling months making this film, do you foresee yourself making more films? What’s in store next?